We believe tax reform is on the horizon. The questions are, how will it occur, when will it occur, and what will tax reform look like for you? The President, while visiting the Treasury Department on Friday, April 21, announced that he would unveil the outline of his tax reform plan on Wednesday, April 26. We believe that, before any comprehensive tax reform is undertaken, the current Administration needs to address the tax aspects of the Affordable Care Act (ACA). A repeal / replace measure for the ACA did not have sufficient Congressional support, and was not brought to a vote in March 2017. If the Administration chooses not to address the tax aspects of the ACA first, they will have to make up a large deficit in order to effect any permanent tax change. One of the major challenges facing tax reformers stems from the taxes included in the 2010 ACA. These taxes include an additional 3.8% tax on investment income for high-income households, and an extra 0.9% tax on top earners’ wages. It is our belief that the current Administration and Congress should make a second attempt to address the tax aspects of the ACA. This would reduce the budget deficit by ~$150 billion over 10 years, and would also pave the way for broader tax reform. The next stage would be to enact a revenue-neutral tax reform bill, which would be a permanent tax change. However, if it were a non-revenue-neutral reconciliation bill, any tax changes would only be temporary, expiring at the end of a 10-year horizon. We would prefer to see a revenue-neutral bill, with tax rate cuts offset by increases elsewhere in the tax code, such as the elimination of certain deductions. 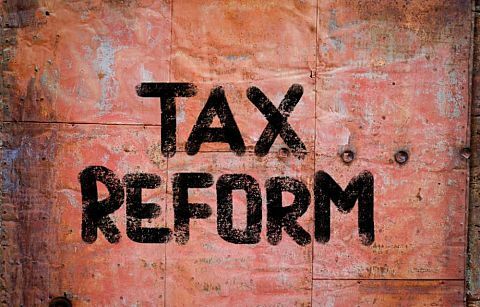 There has been no comprehensive tax reform in the 31 years since the 1986 Tax Reform Act; we feel that the time is ripe, and would like to see a complete overhaul and simplification of the United States Tax Code undertaken. 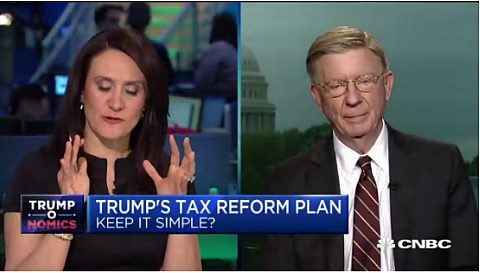 Tax reform is complex, and a thorough evaluation of what needs to be done, and how to do it properly, will take time. We would not expect to see a bill which would both truly represent comprehensive tax reform and pass Congress before the end of 2017. In our opinion, it would be better to have a good bill later than a bad bill now. In her very timely Wall Street Journal opinion column this week, Nina E. Olson, the Internal Revenue Service’s (IRS) national taxpayer advocate, reminded us that, “The root of all evil is in the complexity of the tax code.” Indeed, as Ms. Olsen notes, it would be a good idea to simplify the tax code to the extent that IRS employees can answer taxpayers’ questions accurately. Simplification would also reduce the cost of tax compliance, which the Mercatus Center estimates at nearly $1 billion annually. Ms. Olsen, in fact, sets forth a proposal of her own – no specifics, but a laundry list of over-complex areas which could and should be simplified, including the separate tax incentives encouraging education savings (12), retirement savings (15), “family status” provisions (6), etc. 75% of American taxpayers pay more in payroll taxes than they do in federal income taxes. Taxpayers in the lowest 50% of Adjusted Gross Income (AGI) generate 3% of total U.S. federal individual income tax revenue. We believe that the tax code needs a thorough overhaul that truly simplifies it, and this may take some time. We do not believe that tax reform will occur quickly, nor before December 31, 2017. This is a complicated issue, which must be effected by people of substance, such as those who enacted the 1986 Tax Reform Act. We agree that the individual tax brackets need to be lowered, and consider that a good starting point toward simplification would be to reduce the number of brackets to 3, with the maximum rate – i.e., the top bracket – at 33% (down from 43.8% currently). We believe the 3.8% percent tax on net investment income for high-income earners and the additional 0.9% tax on top wage earners should be eliminated from the ACA. We believe this is likely (and desirable) to be addressed prior to any comprehensive tax reform. We would like to see the alternative minimum tax on individuals repealed. We advocate simplified reporting for individuals, including those who are self-employed and who own small businesses. Current income tax rules are overly complex. To effect any significant stimulus to the economy, we believe we must cut taxes for the 50% of Americans who generate 97% of federal individual income tax revenue. We would not be surprised if, in order to generate a revenue-neutral tax reform bill, the Administration proposed that the current deductions for contributions to qualified retirement plans be either phased out or eliminated altogether. Currently, U.S. corporations hold over $2 trillion in cash overseas. We would like to see some type of temporary moratorium, so these corporations can repatriate that money back to the U.S. without any adverse tax consequences. Such a moratorium should have a defined and limited period – perhaps one year. The American public must be made aware that the U.S. has the highest corporate tax rates in the industrialized world. We think the current Administration will push to lower the top corporate tax rate from 35% to 15%. This would cost the government an estimated $2.0 trillion over the next 10 years; however, we believe that this cut could act as a stimulus to the current economy. We would like to see the corporate alternative minimum tax eliminated. The stock market has reacted favorably, with a 500-point increase to the Dow Jones Industrial Average over the past two days, due not only to President Trump’s anticipated tax reform announcement, but also to the possibility of increased stability in Europe, due to the recent first round of French Presidential elections. We believe that corporate tax reform should couple the above significant rate reduction (from 35% to 15%) with fewer deductions and credits, which would create a broader corporate tax-paying base. The current House of Representatives’ tax reform plan contains a revenue-generator in the form of a border tax adjustment. This tax would be imposed upon imports coming into the United States (exports from the United States would be excluded from this taxation). We believe it is possible that the current Administration may propose to cut the tax deduction for interest expense for corporate taxpayers. Steven M. Rosenthal, a tax attorney at the Urban Brookings Tax Policy Center, stated in an article in the New York Times on Sunday, April 23, that he believes this is a possibility. However, due to the strong lobbying of the real estate industry, we believe it would be difficult to take on a portion of the economy which is currently doing well. Stay tuned to our blog for updates and commentary, once the President’s outlines for his plans for tax reform are released.